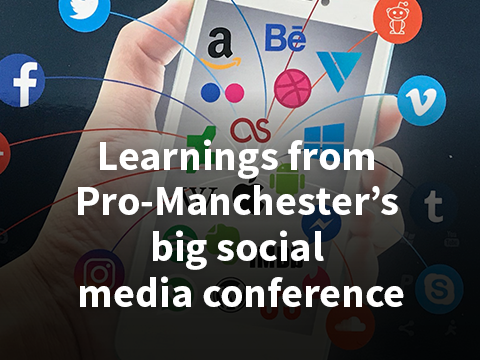 This year’s Pro-Manchester Big Social Media Conference packed out with folk keen to gain insights from experts from around the globe sharing their expertise on all things social media. Sessions covered topics including converting clients from LinkedIn, paid social marketing, influencer collaborations, success with video, future social trends and marketing to Gen Z. There was plenty to learn from those sharing their experience at the event, here are some of the highlights the IF Agency team took home from the day. Best-selling author and world-renowned LinkedIn expert, Melonie Dodaro, all the way from Amsterdam opened the conference. Outlining her trademarked method to turn connections into clients aptly named ‘The Link Method’. Recognising that although LinkedIn is regarded as the “boring” social media tool, it remains the strongest and most respected social media tool for B2B and most definitely should not be ignored. Key advice is to stop building connections and start building relationships. Start online with content that is helpful, educates and adds value then move offline. A paid social strategy is becoming the cornerstone of successful social media marketing. Julia Bramble, a specialist in Facebook advertising, explained the principles and effective strategy that has delivered incredible results for small businesses. The bottom line is that Facebook ads are simply just that - ads! Facebook ads don’t have magical powers – they only work if the content is right. Knowledge and understanding of the audience is key to success, use inspirational video content to create intrigue then use re-marketing programs to present special offers or exclusive, time limited opportunities to drive conversion. Virtual reality and augmented reality might not be right for your audience just yet, but the possibilities offered by these technologies are shifting fast. Stay current and ready to react as adoption rates will increase amongst your audience. After all, look what happened when Blockbuster turned down the opportunity to buy Netflix! Fab fact from this session by Phil Charnock was that Gatorade’s Superbowl AR Snapchat filter received 160 million impressions - significantly more than the 115 million who watched the actual Superbowl! VR and AR may just be mainstream sooner than you think! Consistency is king when it comes to You Tube and viewers love the reliability of a consistent format. The most successful examples such as Ted Talks have even spawned parodies of their original format attracting millions of views. When it comes to creativity, no niche is too niche! Produce content that is compelling so viewers want to share. Collaborate with other brands and influencers to increase the audience reach and raise trust levels. Tailify shared the importance of influencers for brands and e-commerce. Influencers are highly sophisticated digital users; they know exactly what they’re doing when it comes to creating great content. Every day 95m posts will go live on Instagram, feeds are really crowded, collaborate with influencers for successful stand out. Huge and highly engaged audiences mean most brands’ first thought is to use influencers to drive sales. Don't overlook the opportunity to work with them for market research and to drive valuable insight into what really resonates with the target market. Working with influencers to post interactive Instagram polls within their Stories can help brands to quickly discover where their audience stands on a specific topic or trend. Working with influencers and building a long-term relationship allows influencers to know and understand your brand inside out, naturally engage with your brand online, create better content and also be able to engage your target audience better and more authentically. 6. What’s The Future For social media? The final speaker of the day was Oliver Yonchev from global social media marketing agency Social Chain. Oliver shared the insights Social Chain has found through working with Generation Z (anyone born between 1995 and 2010). This generation has been plugged into multimedia since birth. Gen Z are harder to market to, but marketing campaigns that tap into emotional triggers perform best. “Happiness is a powerful force in every aspect of our lives. It’s about managing expectations but also showing this generation why your brand will make them happy,” says Oliver. Thank you Pro Manchester and all the speakers for a great day! See you next year!